Earlier this week, we lost a true believer in the Republican cause. Carole Joyce was a strong conservative, a committed Republican, but beyond that, she was a kind, welcoming soul. Carole knew that the best way to grow our party was to be inclusive, welcoming and accepting of everyone who wants to see more Republicans elected. She was a model activist, a natural leader, and a friend to anyone who knew her. My predecessor, Robert Graham, knew Carole very well, and he wrote a few words as a tribute to this strong, vibrant, kind spirit. I hope you will take the time to read it, and as we head into the weekend, please keep Carole and her family in your thoughts and prayers. Standing 5 feet, 1 inch tall and weighing close to 100 lbs. soaking wet, Carole Joyce is proof that size does not matter. Carole and her infamous email handle paddywagon@cox.net were a combined force not to be taken lightly. Naturally, Carole was a wife, mother, nurturer and a loyal friend. She cared deeply about those around her and had an unwavering love for the greatest country in the world – The United States of America. Her love of people and love of nation motivated Carole to lifelong service as Republican Activist. By word and deed, Carole would tell anyone interested that the Republican party has the best governing principles and values anywhere. If someone proved to be a “hard sell” with respect to the Republican Party, Carole would invite them over for a homemade lunch, dinner or surprise them with her tasty baked goods. On more than one occasion Carole fed the State’s electeds at her home. Her guests ranged from Governors, Secretaries of State, State Treasures, Congressmen, and Senators – among others. Over her well-baked meals, she would compliment their service, share her concerns and encourage new paths. Carole understood the simple principle that serving with love would convert people to the GOP and open meaningful discussions with our representatives at all levels of government. An approach that has helped shape policy in Arizona by protecting the lives of the unborn, gun rights, traditional marriage, free markets, education and public safety. Most have little idea about the remarkable history behind Carole Joyce and the influence she has had on this country. Carole Joyce was a former Board Member of the NRA and always a Life Member, an Olympic Small-bore Rifle Shooting Coach, Nurse working with First Responders, volunteer, Precinct Committeeman, State Committeeman, Corresponding Secretary for Legislative District 24, Member of the 2016 Electoral College and recipient of The Lifetime Achievement Award from the Arizona Republican Party. Carole was the “action” in Activist. She made phone calls, walked neighborhoods, donated to candidates and the GOP. Not having the ability to drive did not keep her from finding speakers, organizing events and attending state and county meetings. No name-calling, no idleness…she worked. Her ambition was to win and do whatever it would take to protect the people of Arizona. She had a mind of her own and would fight for what she believed was right. Some will remember her as a faithful wife, loving mom, best friend, great cook, fearless activist or someone who cared. Carole did not remove humanity from politics she brought them together. She will be missed. Robert Graham served as the Chairman of the Arizona Republican Party from January 2013 though January, 2017. PHOENIX – This morning Chairman Robert Graham of the Arizona Republican Party announced that based on the results of the March 22 Presidential Preference Election and the successful completion of the April 30 Republican State Convention, he is fully supporting Donald Trump as the party’s nominee for President of the United States. As a delegate to the Convention, he will cast any and all of his votes for Donald Trump. “As Chairman of the Arizona Republican Party I support the will of the majority of our party’s voters who voted to support Trump by a two-to-one margin. 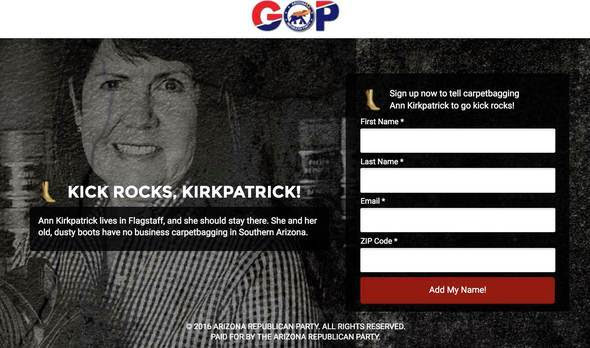 So the choice is clear: Arizona Republicans support Trump, and I enthusiastically join them. As a delegate I will support their will with every one of my votes for Donald Trump to be our party’s nominee,” said Arizona Republican Party Chairman Robert Graham. Saturday’s Arizona Republican State Convention was packed with Republicans supporting of multiple candidates, and more than 800 competed to become one of Arizona’s delegates to the National Convention. Each of Arizona’s 58 delegates is bound to Trump in the first round of voting but unbound after the first vote if no candidate receives a majority. “Donald Trump’s Arizona Chairman Jeff DeWit and the Trump campaign worked hard to capture the majority of delegates. Given the slate vote counts, if the national delegate at-large elections were a one-to-one match between Trump and Cruz or Trump and Kasich, Trump would have been the clear winner retaining the majority of delegates,” added Graham. PHOENIX – This afternoon Chairman Robert Graham of the Arizona Republican Party thanked the members of the Arizona State House of Representatives and the Arizona Senate for passing a bill to ban ballot harvesting. Ballot harvesting is a tactic used by some campaigns to send people door-to-door and neighborhood-by-neighborhood to collect ballots from unwitting voters. Once in the hands of campaign staff, the ballots are vulnerable to tampering, or even being discarded if they are opened and found to be supporting an opposing candidate. PHOENIX – This morning Chairman Robert Graham of the Arizona Republican Party congratulated his counterpart, Arizona Democratic Party Chairwoman Alexis Tameron, on her announcement yesterday of her support of Gov. Doug Ducey’s Education Funding Plan. The measure, Proposition 123, will be on the ballot in May of 2016. If approved by voters it will increase K-12 funding by $3.5 billion over the next ten years. “I want to thank the Chairwoman for publicly announcing her support,” Graham added. Tomorrow morning I’ll be speaking at a rally against Planned Parenthood. Like many of you, I have been sickened by the videos showing a behind the scenes view of the abortion industry. We’ll start at 10 am across the street from the Planned Parenthood headquarters at 4751 N 15th Street (map) in Phoenix. Congressman David Schweikert and Maricopa County Attorney Bill Montgomery will also be speaking, along with members of the community and medical professions. Planned Parenthood, 610 N Alma School Road (map) 9:00 – 11:00 a.m. Planned Parenthood, 2500 S Woodlands Village Boulevard (map) 9:00 – 11:00 a.m. Planned Parenthood, 5771 W Eugie (map) 9:00 – 11:00 a.m. Planned Parenthood, 1250 E Apache Boulevard (map) 9:00 – 11:00 a.m.
Meet at 2120 N Beverly Avenue (map) 9:00 – 10:00 a.m. I hope to see you Saturday morning! For the past few days I’ve seen attacks on my character and allegations made and assumed that people would know they were bogus. Unfortunately, I’m finding that some folks will lie and malign without regard to facts or due process if it means holding on to a little power, and in a large state and county, people aren’t sure what the facts were. You have only read one side of the story, and it is factually incorrect and offensively defamatory. For new PCs who may not know me, I am a grassroots conservative who’s been involved in the party for two decades. I’ve given my life to this party. You have elected me as your assistant secretary of the state party twice unopposed. I served under Tom Morrissey, was actively involved in the party under Randy Pullen, and have served the past few years under Chairman Graham. I have been there counting petitions on controversial issues like the McCain censure. At all times I’ve acted with integrity. Some other names you may not know — Sharon Giese is our elected National Committeewoman and has served in that capacity with Randy Pullen, Tom Morrissey, and Chairman Graham. She has also served as the RNC’s elected Parliamentarian. Chad Heywood is the Executive Director of the Arizona Republican party. George Khalaf is the Political Director of the Arizona Republican party. Jerry Clingman, the chairman of LD 16, did not attend his own meeting to stand for re-election. Jerry was in Wisconsin on a hunting vacation, and he’s still there now! That he speaks as if he were a witness to events at the election is a joke. Here are the facts of what happened at the LD 16 meeting, as will be attested by myself, Sharon Giese, Chad Heywood, George Khalaf, and MANY LD 16 PCs who were eye witnesses to the entire process. Jerry Clingman asked 1st Vice Chairman Mara Benson, a candidate for re-election, to chair the meeting in his absence. Mara asked me for assistance because she knows my background and integrity with the elections process. Jerry had failed in his duty to appoint a Credentials committee before he left on vacation. Seemingly at the last minute, he asked his live-in partner, Kay Reardon, a candidate for Corresponding Secretary, to manage credentials. It soon became clear to Mara and me, and many other members present, that Kay was in no way prepared for this duty. 1. Kay had asked volunteers who were not Precinct Committeemen to help with credentials. This is against LD 16 by-laws. I informed Kay that this could not be allowed. 2. Kay had no plan to validate proxies on signing in or to determine the right amount of ballots for each PC based on proxies carried. 3. Kay did not bring a ballot box. It makes you wonder if she even realized we were having an election. Kay’s lack of basic preparation put Mara in a bind as the presiding officer. In order to ensure a smooth and fair election, she asked me to observe and help with the process. Chad Heywood and George Khalaf from the state party were also there to observe. Maricopa County had sent no representation. Neither Chad nor George checked anyone in at credentials. Chad simply gave his perspective when asked about disputes. Nobody disputed the credential process. There was a motion from the floor to accept the credentials report, and it was passed without questions. Nobody was turned away. Credentials were approved by the body at the meeting and NOT ONE PERSON AT THE MEETING QUESTIONED IT. Not even Kay Reardon. Kay sought to invalidate two proxy forms because they did not provide the witnesses’ phone numbers. Her argument was that if you don’t have a witnesses number you can’t verify them so they should be thrown out. Take a look at the official proxy forms in the MCRC and AZGOP bylaws, and you’ll see that there isn’t even a place on the forms for a witness phone number. I concluded and communicated that a proxy form is valid if it includes the correct information and signatures. You can’t throw out a proxy because a witness who is not a voter in this election doesn’t have a phone number. Not even voter registration requires a phone number! Just as the affidavit for becoming a PC asks for email and phone number, but does not require it. The legal counsel to the state Republican party who has served in 3 different chairmen’s administrations agrees with me on this. Mara as the presiding officer accepted the proxies. Two proxies were thrown out because they did not include the name of the person who was carrying the proxy. Senator Dave Farnsworth was carrying them. Dave understood it was an effort to play by the rules and respected the judgment whole-heartedly. He is a good man. AT ALL TIMES KAY WAS PART OF THE PROCESS and JERRY CLINGMAN THE ACCUSER WAS NOT IN ATTENDANCE! Michelle Ives who was in attendance sat at the proxy table and viewed what was done. I understand that there can be differences of interpretation, but when that is the case, the chair of the meeting makes the final judgment and the chair of the meeting was Mara Benson. Brian Orner grabbed an open crate at the school to be used for a ballot box because Kay did not bring one. Chad Heywood asked Spencer Pearce, a candidate for 2nd Vice Chair and a nephew of Russell Pearce, to observe the box as ballots were cast because he knew that Spencer was a friend of Kay and Jerry and Spencer’s integrity was without question. George Khalaf from the state party also viewed the ballot box to make sure it was observed at all times. Chad Heywood invited Representative Kelly Townsend to observe the vote counting as an act of transparency. Kelly had endorsed and spoken for Jerry Clingman who was not there for his own meeting. I believe that Chad invited her to observe so that Jerry’s supporters would feel confident in the fairness of the process. In the room counting votes were Spencer Pearce, Chad Heywood, myself, Michelle Ives, and another PC whom Jerry and Kay had asked to help with the process. The state committeeman nomination process began, and voting began for the state committee. Mara the chair then read the results of the officer election. Of the 108 eligible PC’s, 33 attended by proxy and 52 were present for a total of 85 voters. 79% turnout! Even with the disputed two proxy forms the results were very clear and nobody was in the margin of error. · has not reviewed our proxy forms. · has not asked for the vote count. · didn’t have the decency to call me, Chad, Mara, or any of the PC’s to weigh the evidence. AJ has appointed himself judge, jury, and prosecutor in this matter and still has not given a clear reason of evidence for why he is trying to invalidate and discredit an election that had 79% PC turnout without even consulting or notifying his board and the executive guidance committee. I’m not sure what his motivations are, but I’m more than disappointed — I’m disgusted that he would spread accusations without even making the smallest effort to get more than one side of the story. Do Chairman LaFaro and Jerry Clingman really think that Sharon Giese, the national parliamentarian, is lying and part of a rigged Legislative District election? That she would approve invalid proxies for two votes in a landslide election? As a lifelong conservative I would appreciate a public apology from Jerry Clingman and AJ LaFaro for slandering me and the work I did to serve the party at this meeting. I also would like the briefs to apologize for spreading accusations as fact. “Fred DuVal awoke this morning to news that a national environmental group’s poll showed him losing to Doug Ducey by eight percent. Then voters heard from DuVal, in his own words, that he doesn’t support parents knowing about their children’s abortions, believing government should have more say than parents. Needless to say, voters didn’t like it. Next, DuVal was reminded of something haunting from his past: in 1999 DuVal chaired a government committee that made recommendations to give clemency to a terrorist group. This afternoon, an ad was launched featuring the son of one of the victims killed by the group DuVal was a part of giving clemency to. We can only imagine how DuVal felt knowing he was a part of giving clemency to despicable people. 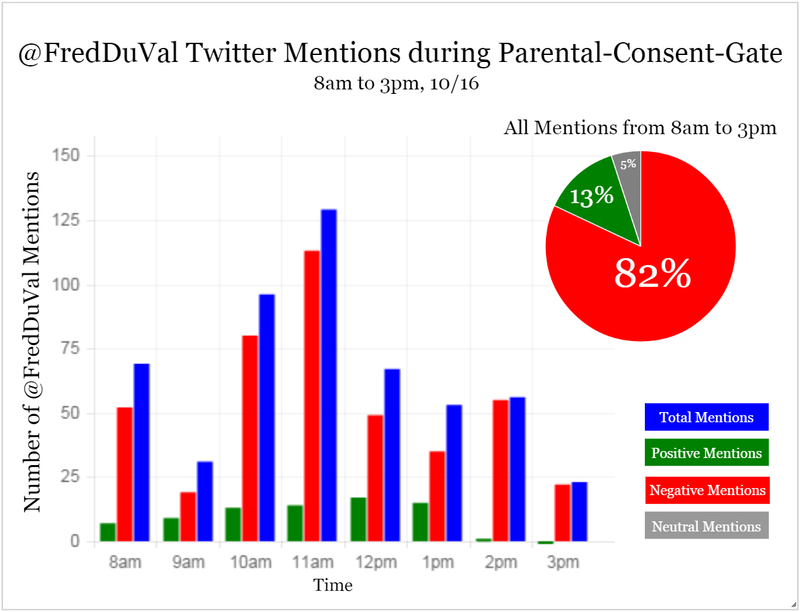 Social media analytics from today showed the following sentiment about Fred DuVal. 82 percent of voters’ discussions about him were negative. Unfortunately for Fred DuVal, parents still like to have say in their children’s decisions, and people don’t elect to leadership lobbyists and insiders that give clemency to terrorists.